I had earlier on my blog, done a story on the Weavers of Andhra Pradesh from the Karipakam – Patur region. Just like that, are other artisan villages in India which are so exclusive and distinctive in their technique that they lend their name to the Handicraft, irrespective of the form they take. Which is why I have decided to start a series titled ‘Artisan Villages’. I shall try and visit as many of these places as I can, in the process, learning and documenting traditional art forms prevalent in India from as far back as one can remember. I begin this series, with one closest home, Cheriyal. An hour away from Hyderabad is the village of Cheriyal in Telangana. Here is where the famous ‘Cheriyal Scrolls’ come from. 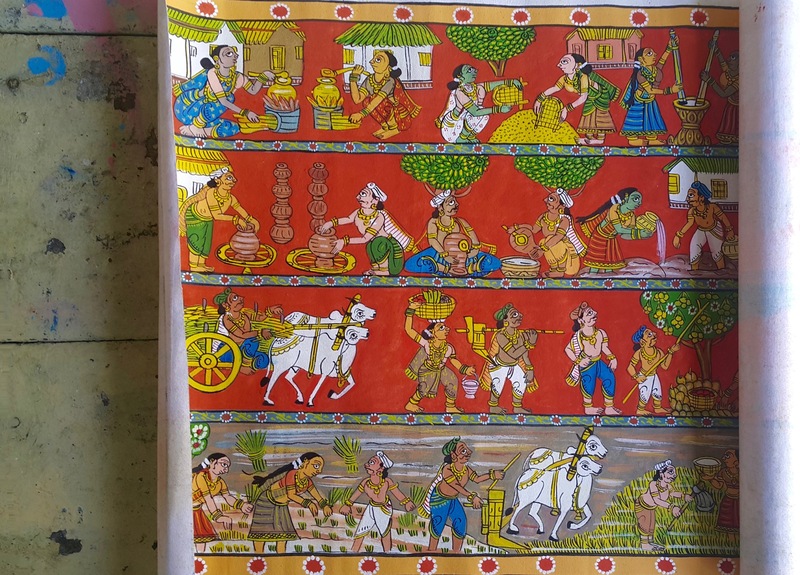 These canvas scrolls made from Khadi are hand painted in a style unique to the local motifs and iconography. Characterised by a dominance of the colour red in the background, these brilliantly-hued paintings even received Geographical Indication Status in 2007. Painted in panels as a narrative, these are like comic strips from the past, depicting scenes and stories from Indian mythology and epics. Distinct in their style they immediately convey the age old Indian traditions and customs in a beautiful and engaging manner. Of which, both, Lords Krishna and Rama are prominent and the most recurring. Originally used by the village bard as a visual aid to go with his stories and ballads, these scrolls have all but phased out with today’s more mainstream ways of storytelling and entertainment. The traditional Cheriyal Scrolls were sociologically and culturally significant in their time, for their use as a tool for educating the illiterate villagers. From a scroll that once had up to 50 panels, they have now come down to a single panel, as these artists adapt to its modern use as wall art. Also coming from Cheriyal, are masks and dolls modelled along the same theme of ancient Indian mythology and local folk lore. These masks range from as small as the ones sculpted and painted on coconut shells to as large as the ones moulded in cement. Now, there are very few artists practising this traditional art form, with Cheriyal being the last village standing that continues to produce these scrolls and masks. Of the three remaining artist families in the village are the husband and wife duo, Vanaja & Ganesh. They are both government recognised artists, who have had the honour of transferring these Cheriyal Masks as 10 feet wall murals in Nagpur for the President, Mr.Pranab Mukherjee’s visit some time ago. While, Mr.Ganesh has conducted workshops under the South Central Zonal Cultural Centre’s Guru Shishya Parampara Scheme. Their two daughters also chip in during their time off from school, for these village arts are usually a family occupation. All in all these scrolls when framed, make for gorgeous gifts. So if you are looking at exclusive party favours or corporate gifts with that characteristic touch of Indian-ness, you know where to go! Getting There: Ideal for a quick day trip, Cheriyal is 54 Km from Hyderabad and can be reached by road in less than an hour and a half. Take the NH44 to get there. On the Way: Make a pit stop at any of the Dhabas in Kompally to refuel. Get in Touch: With the artist, Mr. N Ganesh on +91 9000181059. Wow N, amazing post on our dying art forms and their courage to survive! such heritage in our country! Thank you so much. 🙂 So true, I only hope to be able to cover many such. Love the simplicity of the scrolls, yet each tells a story & sets off your imagination!! Lovely story with lovely pictures! how wonderful. i never knew about this form of art.